Mixing Granulator, the process of Mixing, Wetting and granulating can be completed in single working period. It is suitable in the line of pharmaceutical, food, chemicals industry. It is one of the advanced facilities which meets the GMP requirement and has the characteristics of high efficiency, best quality, low consumer, none pollution as well as safety, etc. 1.Mixation and granulation in a stainless steel construction. 2.The journal is sealed by clear air. 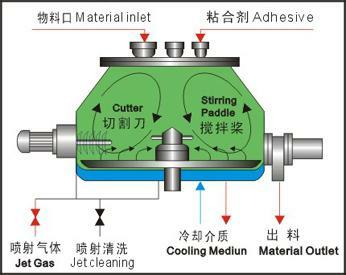 3.Three-dinensional stirring and mixing that ensure high Degree of consistency.The Process of mixing. Granulating can be Completed in single. working period which meets the GMP requirement. Compare with other normal equipment. The efficiency is 4-5 times higher than that of others. but the consumption for adhesive is 15-20% less than the traditional technology. 4.Having protective divce that en-sure produce saftly. 5.Among the above machines, the speed of the stirring of the paddles of Model HLSY100S and HLSG100 HLSG200 the speed of the granulating knife shall be set up and controlled by a frequency transformer. It can be widely used for granulation in various industries. The granulating process is divided into two procedures of mixing and grain forming, which are finished in the same vessel. Powder materials in the fixed tapered vessel are hit and dispersed into semi fluid rolling state and given a complete mixture under the stirring action of mixed stock. With the infusion of bond, the powder is gradually moistened and the shape of materials is changed, which has strengthened the extrusion, attrition and kneading functions of the mixing paddle and vessel wall on the materials and thus formed evenly wet soft materials. These soft materials gradually turn into fine and homogeneous wet grains under the high -speed cutting and grain forming of the granulating paddle and eventually discharged through the outlet. The grain size is dependable on the material characteristics, rate of material preparing tool and time of grain forming. It is suitable for producing tablets and capsules in pharmaceutical industry and may provide ideal granular raw materials for the operation process of tablet or capsule forming. 1) Grains produced by this machine enjoy true-ball sense, good fluidity and homogeneous material, which may effectively boost tablet pressing, improve tablet quality and enhance the capsule filling and thus make the tablets enjoy better brightness, hardness, disintegration and discharge. The production cost is also saved. 2) The part in contact with materials is made of stainless steel 316 L while the appearance part is made of stainless steel 304. 3) It is an ideal wet-process granulating equipment of fine fabrication provided with considerate safety chain and auto water cleaning system which is convenient for cleaning and free of metal stains at dead angle and material deposit. 4) Based on the different features of Chinese and western medicines, wet process mixer granulators are divided into Chinese medicine type and western medicine type. 5) Human-computer interface/PLC control may be configured or exclusion of explosion may be adopted according to the demand of users.